As the weather warms up and that last frost of winter moves further away, we are starting to see gardeners in action! Gardening provides many benefits no matter your age, such as stress relief and joint dexterity. Planting a garden – or visiting one! – is a perfect way to spend time outdoors, together! Plus, if your garden grows vegetables, you’ll have an endless supply of tasty and healthy snacks for summer! Enjoy the following tips and tricks for gardening with your little ones. Tiny Tools – You may have noticed our seemingly endless collection of toddler-sized tools in the sensory bin. These miniature versions of real tools allow children to safely experiment and explore, while becoming comfortable with tools that they may see their adults using. Don’t have a garden? Bring these tiny tools to the park to encourage digging and exploration! Jobs, jobs, jobs! – Gardening is a perfect group activity because it involves so many smaller tasks. While your toddler may not be able to dig a hole, place a plant, and cover it with dirt, he or she can definitely help with watering. Picking dead buds or small weeds is another useful activity for tiny hands! Making mud pies, while not directly beneficial to your plants, is also productive! Favorite Fruits and Valuable Veggies – Let your little ones have a say in what you plant (within reason!). While you may not have room for a sprawling watermelon vine, a cherry tomato plant will provide you with endless juicy treats. Do your toddlers enjoy eating greens? Plant broccoli or cabbage and watch them grow! Toddler Zone – If possible, set aside a small area of dirt that little hands can dig in whenever they want. Once your plants are settled in, they will not want to be disturbed! Having a designated toddler zone can help keep your plants growing, and your toddler happy! Don't have room for a toddler dig zone? 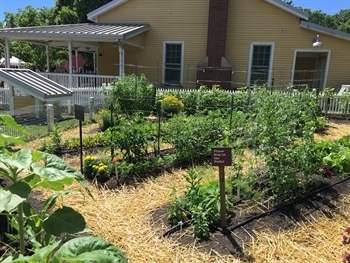 Stop by the Farm-in-the-Zoo to visit our Edible Garden (Wednesday, Thursday, Saturday, 9:30am-12:30pm). Garden Décor – Gardening doesn’t just involve plants! Help make your garden your own by creating a toad abode or fairy home within your plants. Search for rocks for little ones to paint, creating a colorful border for your garden. Use popsicle sticks to mark which plants live where and encourage your toddler to help add some color! Together, you can create a welcoming environment for plants and animals! Your garden will attract bugs, both good and bad. One bug does not make a problem and not all pests require action. The best way to maintain a happy, healthy garden is to understand the difference between “good” and “bad” bugs. Planet Natural recommends inspecting your garden regularly to detect problems early. The sooner you find a “bad” bug, the easier it will be to manage using earth-friendly methods. Click here for Planet Natural’s list of common garden pests and earth-friendly solutions for everything from aphids to wireworms. Don’t let insects “bug” you! Garden pest control is a perfect task for you and your toddler. Take a few minutes each day to go on a bug hunt! Your toddler can help identify bugs that are beneficial to your garden, and those that aren’t – it’s easy! We created a simple bug BINGO sheet for you. “Bad” bugs are accompanied by a sad face, while “good” bugs are paired with a smiley face. See what you can find in your garden! Many bugs and other animals that you see are pollinators! They're working hard to help sprout new plants, so they're visits aren't always bad. Want to learn more about which plants attract pollinators? Visit our earlier blog post on bees, bats, beetles, and birds!